A towering icon within a vibrant Central Business District, the new 1,048 room Fairmont Austin is uniquely located amid the lush greenery of Palm Park and Waller Creek and directly connected to the Austin Convention Center. Innovative Carpets had the immense pleasure of teaming up with the design talents of Warren Sheets Design to create and deliver 20,000 sq/yds of Axminster carpet to multiple areas of the hotel. The unique designs on display in the meeting rooms, boardrooms, prefunctions and multiple ballrooms beautifully evoke the unique location of the hotel by taking inspiration from the surrounding parks and nature. Guests indulge in exquisite dining, a pampering spa and state-of-the-art meeting facilities. Fairmont Austin engages guests with the city’s famed music scene, as well as the area’s celebrated cuisine and diverse artistic lifestyle. Right outside of LaGuardia Airport, this modern hotel boasts an unbeatable location close to Manhattan and top destinations like Citi Field, Arthur Ash Stadium, and the Metropolitan Museum of Art. 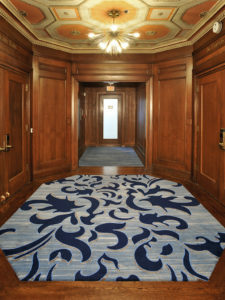 Coupled with the design expertise of New York design firm Krause Sawyer, Innovative Carpets worked to outfit multiple key parts of the hotel, which included the Ballroom, Prefunction, Meeting Rooms, M Lounge, and the Great Room. 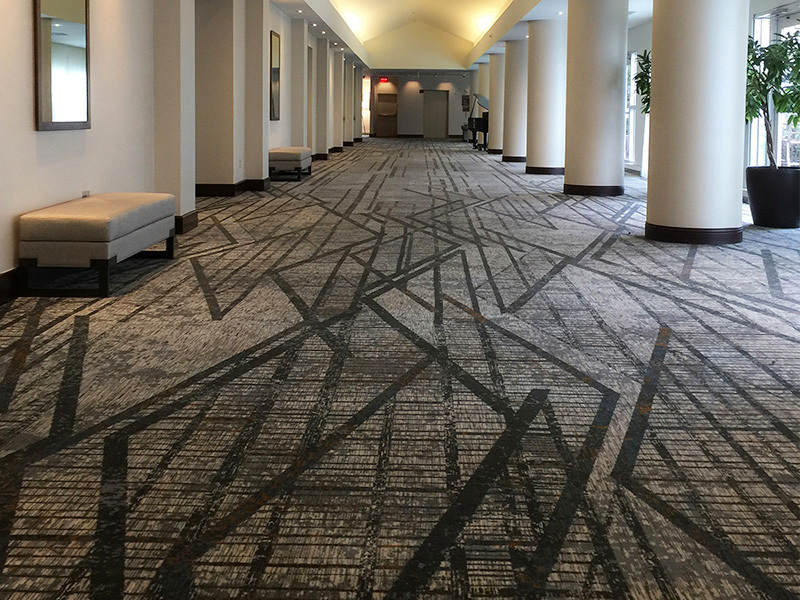 In total, the Innovative team custom designed, manufactured, and delivered over 3,000 sq/yds of beautiful Axminster carpet to the newly renovated hotel. The Santa Rosa Golf & Country Club is an exclusive club in which its members enjoy Golf, Sporting activities, family fun and fine dining under one roof. It was no coincidence Castor Design Associates chose Innovative Carpets to bring their carpet designs to life! Custom Axminster carpets can be found throughout the club including the Ballroom & all fine dining areas. Club members demand an unparalleled experience during time spent at the club and Innovative has provided this venue with a visually appealing work of art beneath their feet. We are proud to have our Axminster carpets remain as a main focal point in the design scheme for years to come. The Ritz Carlton, Laguna Niguel is situated atop a 150-foot seaside bluff with breathtaking views overlooking the Pacific Ocean. A luxurious Mediterranean-style resort infused with the playful, relaxed spirit of Southern California. Whitespace Interiors called upon Innovative Carpets to bring their design concepts to life, requesting custom fabricated Handtufted rugs & Axminster Carpets, throughout the Main Concourse Lobby & Public Areas. We believe these beautiful hand tufted rugs were the perfect choice for a resort that takes luxury and attention to detail to the next level. In addition to the Main Concourse, our rugs can also be found inside of Bar Raya, a gathering place in the casual confines of the Bar’s sophisticated, yet friendly atmosphere. The Wharf, located in the Southwest Waterfront on the shore of the Potomac River offers gorgeous views of both land and sea! The welcoming Décor of this hotel combines a rustic feel with a contemporary twist. This project was a collaboration between Innovative Carpets alongside NY design firm, Krause Sawyer. The design team had visions of custom designed carpets that provided guests with a warm and welcoming environment. Innovative took this vision and provided the client with a finished product that exceeded expectations. Our breathtaking Axminster carpets take center stage in an area designated as “the retreat”, as well as guestroom corridors and the elevator lobbies. We truly enjoyed every aspect of this project and we are confident this hotel will set the bar in the DC area for years to come. The Ritz – Carlton Half Moon Bay is set is set on a parcel of land above the Pacific Ocean and offers a secluded space with breathtaking coastal views. The grounds of this upscale Hotel include two championship golf courses, fire pits and a luxurious spa. Whitespace Interiors created an elegant and timeless design for this project and Innovative Carpets transformed their concepts into a finished product we can all be proud of. This project consisted of both Axminster carpets, as well as our custom made Handtufted rugs. Our rugs and carpets can be found in areas such as the Wine room, Library, Lobby lounge and Conservatory. 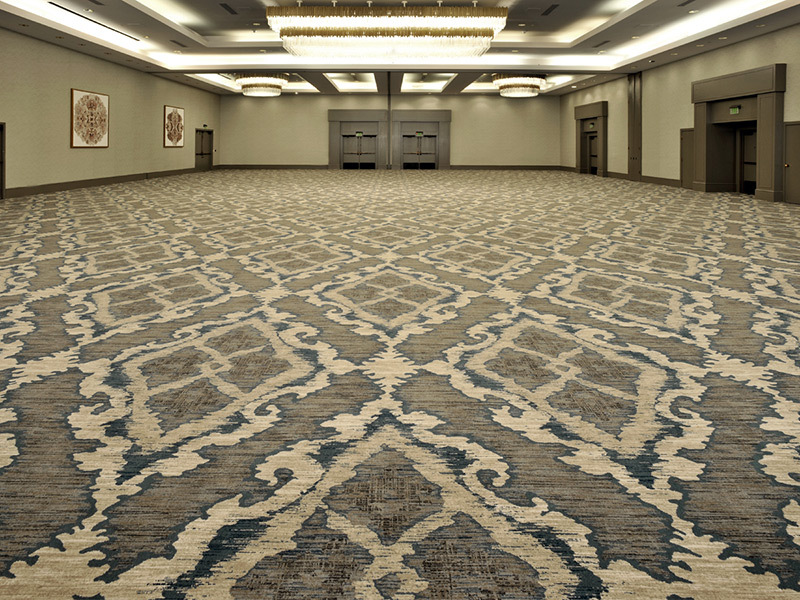 Our Axminster carpets can be admired not only in the ballroom, but across 17,000 Square feet of elegant meeting rooms. Clients such as the Ritz – Carlton expect elegance and Prestige in all aspects of the hotels aesthetics, Innovative Carpets exceeded these expectations with our commitment to outstanding design and superior project management. In front of the majestic backdrop of the Rocky Mountains, Starwood’s Hotel Talisa is a destination filled with understated, yet opulent, mountain comforts. Leo A Daly created transitional Colorado interiors to compliment the breathtaking scenery using a mixture of cool grays, blues and warm brown tones. 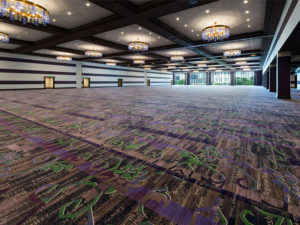 Innovative Carpets brought Axminster designs to reality with 11,000 sq/yds of carpet for the Ballrooms, Prefunction Areas, Meeting Rooms and the Guestroom Corridors. Check out our Handtufted Rugs in the Game Room, Fireside Lounge, Entry and Library. You may never want to go out in the cold again! July 15, 1899, saw construction begin on The Iroquois hotel, and the unique Midtown Manhattan boutique hotel has withstood the test of time. During the years, the historic hotel has changed hands many times, but all of the owners have managed to maintain it remarkably. This remarkable hotel has a high class image to uphold and Innovative Carpets teamed up with the design talents at Tihany Design to deliver 6,000 sq/yds of custom Axminster Carpet into the Guest Rooms and Corridors of this prestigious hotel, where stars like James Dean and Mrs. Leecy R. Woods once resided. Stop in to the Iroquois Hotel in order to experience one of the finest historic hotels offering boutique accommodations in NYC or simply stop in to dine in the acclaimed Triumphed restaurant! Ahhh, to be in the Caribbean! Sandals Barbados, offers undeniable luxury, accommodations, and international appeal. You can relax to a calypso beat, enjoy the sun and sea, and explore the luxurious resort designed with the guests’ utmost comfort in mind. Innovative Carpets was more than pleased to work with the talents of Hospitality Purveyors on the Ballroom and Boardrooms of the exclusive Caribbean resort. The custom Axminster designs are sure to invoke that authentic Caribbean charm. Everything Hamilton is hip again! 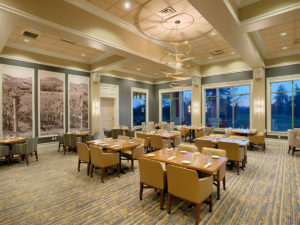 The Wyndham Hamilton Park just completed its $13 million dollar renovation and Innovative Carpets was pleased to work with Krause Sawyer updating the Public Areas with over 9,000 sq/yds of Axminster carpet. Taking inspiration from the many historic parks in The Garden State, a trellis motif supports a mixture of rustic natural elements and historic text in weathered shades of copper, silver and pewter. As New Jersey’s self-evident premier hotel for business and pleasure travelers, The Wyndham Hamilton Park serenely blends heritage and modernity. Miami flavor heats up at the SLS Brickell! Become a part of art as you cross over 1,200 sq/yds of custom axminster carpet and 3,300 sq/ft of handtufted rugs. Once again, Innovative Carpets is excited to bring the stunning, large scale visions of Philippe Starck to life in jewel tones and gorgeous detail. Nonchalantly study your reflection in the Prefunction mirrored columns against a backdrop of black, white and an explosion of fiery orange. Or, if you prefer, grab a cocktail, head up to the Mezzanine where our handtufted rugs invoke a world traveler, part Bond, part Indiana Jones. Make sure to be seen on the pool deck and savor the creations of award winning chefs. Give it all you got at the SLS Brickell. !Dale, La Vida Buena! Convenience never looked (or tasted) so good. Enjoy the DoubleTree by Hilton Hotel with their signature freshly baked chocolate chip cookie. Located just minutes from the Bradley International Airport, the DoubleTree is perfect for the business or family traveler. Innovative Carpets had the pleasure of working with Sandra Foster Interiors to create over 4,000 square yards of free-flowing organic designs for the Guestroom Corridors, Prefunction and Meeting Room Spaces. The Versatility of design elevates every event to a new level of sophistication. Style now has a layover at the DoubleTree Bradley Hotel. Sometimes, it’s both who you know and where you are in Washington that makes all the difference. 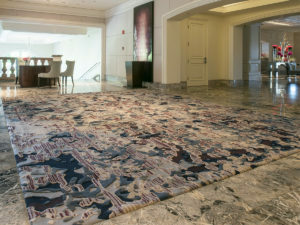 Innovative Carpets teamed up, first, with Getty’s Chicago to create classically elegant, texture infused designs for the Washington Marriott Georgetown Corridors. Just like the city, with its many layers of history, the 5,700 sq/yds of Custom Axminster Carpet effortlessly weaves layers of tailored design in complex shades of gray, as nothing is just black and white. Next up was Whitespace Interiors, who told their own layered story with over 3,800 sq/yds of Custom Axminster Carpet for the Public Areas, featuring subtle suggestions of transparent water. Their Ballroom and Meeting Room designs offer the perfect backdrop in cool grays, warm neutrals and calming blue tones while their Handtufted rugs in the MClub and Lobby Lounge are sophisticated studies in texture. Work and Relaxation in the heart of D.C.! If only everything in Washington were so simple. The Mohegan Tribal Gaming Authority has been anticipating a new tower since before the economic downturn in 2008 and was extremely proud to open the doors to the new Earth Tower on November 18, 2016. This brand new tower at The Mohegan Sun is comprised of 400 rooms. The guest rooms and suites in the Earth Tower are filled with modern features including ultra-fast Wi-Fi and intelligent technology throughout. Innovative Carpets teamed up with Daroff Design to create the patterns for more than 8,000 sq/yds of Axminster corridor carpet. Location, Location, Location! The Marriott Irvine offers it all for guests on business or vacation. The vibrant, contemporary décor with coastal accents is on full display in 27,000 sq. feet of meeting space, 481 rooms, and the lively FLOE Lounge and Outdoor Patio. Innovative Carpets had the pleasure of collaborating with Leo A Daly to manufacture over 8,000 sq. yds of Custom Axminster Carpet for the Guestroom Corridors and Public Areas, incorporating waves of deep blue, driftwood grays and sandy neutrals. A refreshing ocean breeze has blown in! West Hollywood and The James Hotel are a perfect pair, a match made in true LA style. The James Hotel brings its design philosophy of infusing residentially styled properties with local, artistic creativity by teaming up with Avenue Interiors. The Public Area carpet designs are a study in understated chic, providing supporting texture and depth to the curated art collection, fantastic California views and beautiful people. And the award goes to…. Combine a beautiful Mountain setting and upscale amenities and you have the new Hyatt Centric Park City, a AAA Four Diamond Resort! This Alpine inspired Hotel is the year round escape for families and business travelers alike, those seeking to enjoy the mountain charm without all of the crowds. 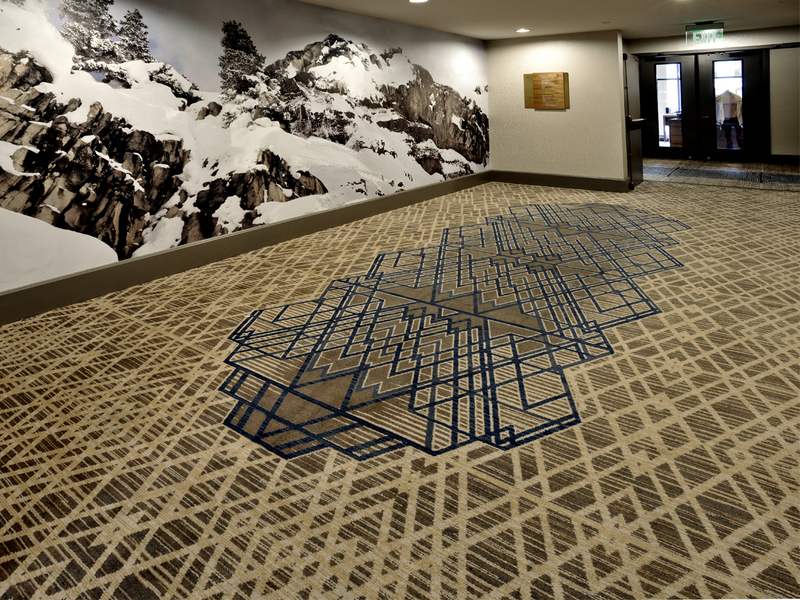 Innovative Carpets teamed up with Los Angeles based design firm, Clear on Black, to design over 4,500 sq/yds of Custom Axminster Guestroom Corridor carpet that is a playful abstraction of mountain tops and winding ski trails. A new take on Nature! Giving new life to one of Chicago’s most historic structures built in 1893 by the legendary architect William Jenney, Kimpton presents “The Gray”. Located in The Loop, The Kimpton Gray Hotel succeeds in creating an exceptional opulence that demonstrates a highly modern yet historically rich environment. Innovative Carpets Collaborated with Beleco Design to manufacture over 5,000 sq/yds of Custom Axminster carpet throughout all the public spaces and corridors. With our refined designs and endless shades of grays we were able to orchestra what the hotel once was to what it resembles now. Rich in design and architecture, The Kimpton Gray Hotel is truly a one of a kind Boutique Hotel. The Kimpton Journeyman became the very first hotel in the historic 3rd Ward section Milwaukee when it opened on June 30th, 2016. The interior is described by some as, “warm industrial.” Interior design firm Warren Red, paid special attention to include details inspired by the city’s history of the locomotive industry. Innovative Carpets worked closely with Warren Red to take their design concepts and bring them to reality in all the public areas. The Four Seasons Hotel Austin is a 9-story hotel located on the shores of Lady Bird Lake, a reservoir of the Colorado River of Texas in Downtown Austin. According to many locals, this luxury hotel sits on one of the best plots of land in the city which embodies everything that makes Austin’s outdoor lifestyle so appealing. The 291 guest room hotel offers an interior that includes elements of flagstone and native art which reflect upon the history of Austin. Innovative Carpets worked with the design team at Whitespace Interiors to create elegant patterned carpets in the public areas which drew inspiration from the glistening and reflective waters of Lady Bird Lake. The new Camby Hotel, formally The Ritz Carlton, opened in Phoenix in December 2015. The hotel was inspired by its location near the city’s historic Camel Back Mountain. The Camby combines innovation, sophistication and a spirit of celebration for those who prefer to add a bit of local flavor to their business and distinction to their play. Innovative Carpets collaborated with Stonehill + Taylor on over 7,000 sq/yds of Custom Axminster carpet to create vibrant designs in the guestroom corridors and sophisticated woven-to-plan public area carpets that exude polish, coupled with creativity. InterContinental Chicago sits prestigiously on the Magnificent Mile located in Chicago, Illinois. Rich in history, boasting stories of an Olympian piercing the water of the 14th floor indoor pool to the Grand Ballroom mural restored by Lido Lippi, whom it was said consulted on the restoration of the Sistine Chapel. Working closely with Whitespace Interiors to compliment the heritage and the stories while updating the Ballroom and adjoining Function Space, Innovative & Whitespace teamed together to bring historical elements in a fresh layout. The compliment to a team well played resulting in a new fresh salute to a historical design story. When in Seattle, sore to amazing heights, 26 stories to be exact. At the W SEATTLE, Innovative Carpets design studio collaborated with the talents of Krause + Sawyer to define high-style in Seattle’s beacon of culture and contemporary flair. 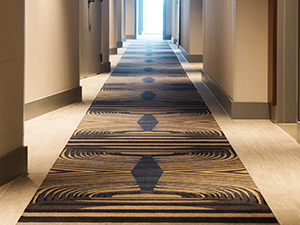 Uniquely designed corridor carpets, with an urban flair, tell the tale of vibrancy, leading guest to spectacular views of the pacific northwest sky. And for those seeking ultimate luxury, prepare yourself for over-the-top extravagance in the EXTREME WOW SUITE. Taking inspiration from the mountainous views, this dynamic carpet design was woven-to-plan for a custom fit and value-engineered to perfectly suit the suite! For those seeking contemporary style in Seattle, you have arrived – W SEATTLE ! December 2015: The Williamsburg section of Brooklyn is eagerly awaiting the opening of the new architecturally sleek Williams Vale Hotel. The Williams Vale sets a new standard for Brooklyn with its world class hospitality and breathtaking views of the Manhattan Skyline. The internationally acclaimed design firm Studio Munge drew upon timeless historical shapes achieving a fresh approach using colors and textures. In collaboration, Innovate Carpets created original patterns in both Axminster and Handtufted Carpets to deliver the edgy yet timeless results in all the guestrooms, suites, and public areas. September 2015: Situated within the iconic, yet charming, neighborhood of Brooklyn Heights, the New York Marriott Brooklyn Bridge welcomes guests with elegance and city-style like no other hotel in this world-famous New York Borough. In 2015, with the design expertise of Krause +Sawyer, the hotel renovated their vast public areas which included 32 meeting/event spaces. In collaboration with Krause + Sawyer, Innovative Carpets worked hand-in-hand to create over 5,500 sq/yds of custom axminster carpets and nearly 3,000 sq/ft of handtufted wool rugs. The fresh, updated abstract style of these carpets now reflects the dynamic vibration of this popular and distinct neighborhood. July 2015: Nestled amid the historical treasures of the Nation’s Capital. This Four Seasons Hotel is the only five star, five diamond luxury hotel in Washington, D.C. Innovative Carpets had the distinct pleasure of collaborating with Forrest Perkins on the Corridor Renovation consisting of 4,000 sq/yds of a very sophisticated and unique Axminster design. January 2015: When you arrive at this sophisticated hotel, you’ll find a charming neighborhood in the heart of Washington D.C. Set on 16 acres, you are just a few steps away from the exciting nightlife of Dupont Circle. 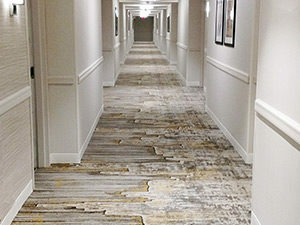 Innovative Carpets had the pleasure working with Leo A Daley on the complete Guestroom Corridor Renovation which was comprised of over 9,000 sq/yds of Custom Axminster carpet. November 2014: This unique and bold twin riverboat casino complex exudes a culture of relaxation and fine dining while still offering fast-action and heart racing gaming. You may choose to be pampered and dined or mix it up with live music, comedians or world-class prize fighting. There is literally something for everyone at River City Casino. Innovative Carpets collaborated with renowned design firm Marnell Corrao Associates to manufacture over 12,000 sq/yds of Axminster carpet for the casino. Intent on maintaining the refined, luxury experience, we developed enduring yet lavish coordinating patterns that make River City Casino & Hotel a must-see, must- play, must-stay designation. August 2014: SLS Casino Las Vegas brings it’s playful yet approachable style and sophistication to the legendary site of the former Sahara Hotel and Casino. Innovative Carpets is proud to be a major part of its transformation. Working in collaboration with the legendary Philippe Starck; Innovative Carpets manufactured photographic images of iconic celebrities who were guests at the Sahara, including Frank Sinatra, The Beatles, and Dean Martin. The list goes on. The Interpretation of Renaissance paintings grace the casino floor where our highly sophisticated Electronic Jacquard weaving manufactured over 8,000sq/yds of non-repeating designs. This is in addition to all of the other unique carpets we manufactured for all of the other public areas. July 2014: The Hilton Anaheim offers a timeless atmosphere whether you are looking for family fun at nearby Disneyland or conducting business in the adjacent Anaheim Convention Center. 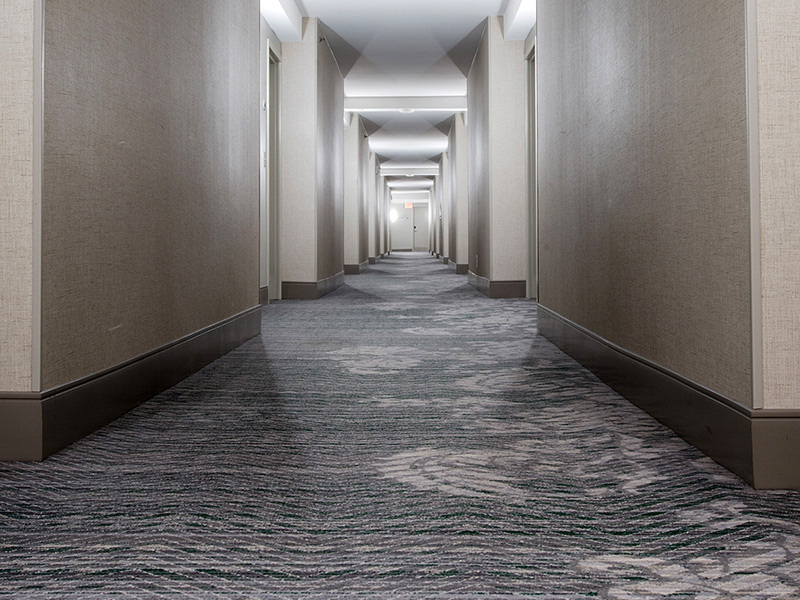 Partnering with the design team of Cole Martinez Curtis & Associates, Innovative Carpets manufactured over 19,000sq/yds of modern, sleek corridor axminster carpet patterns that embody the vibe and energy of not only the hotel, but the surrounding community as well. May 2014: This brand new 1200 Marriott Marquis hotel is a distinctive addition to the nation’s capital. Poised to be the city’s next social hub the MMDC is adjacent to the Walter E. Washington Convention Center and conveniently located near DC City Center and Penn Quarter. 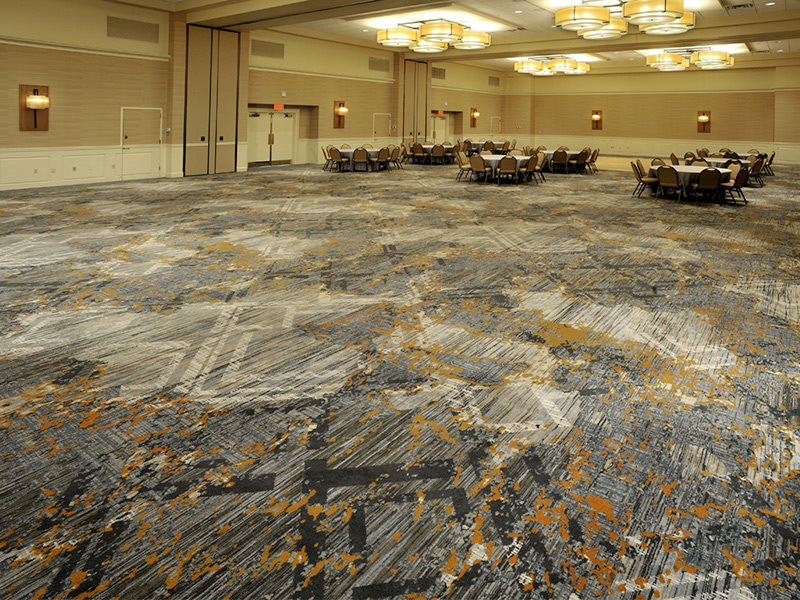 With multiple ballrooms and 54 break out rooms, Innovative Carpets’ 23,000 sq/yds of custom axminster carpet grace all the public areas. 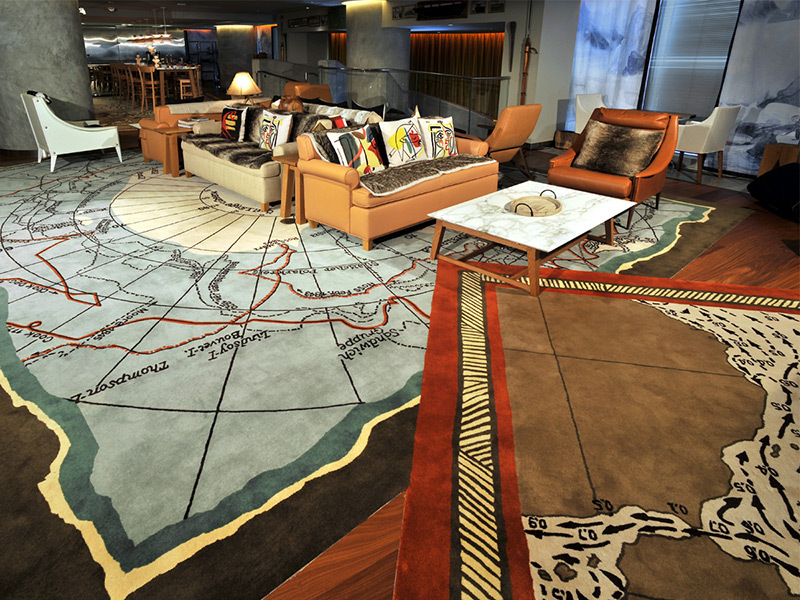 This is in addition to the custom handtufted rugs situated in the grand atrium lobby. February 2014: Known as Indiana’s Premier Riverboat Casino, The Belterra Casino Resort & Spa is an experience you will never forget. This jewel, located on the Ohio River in Switzerland County, provides a “24/7” experience specializing in luxury accommodations, a grand casino, lavish spa and fine dining. The renovation of the axminster public area carpets resulted in patterns with time-honored elegance and polished charm. Working closely with ownership Innovative Carpets was determined to pay homage to the existing classic design intent. Stylishly appointed with 1800 square yards of axminster inset area rug effects and 11,000 square yards of axminster broadloom carpet for the first and second floor deck spaces, we’ve strived to not only meet but exceed the guest’s expectations. November 2013: Sophisticated luxury defines the newly renovated public area axminster Carpets at the Omni Austin Hotel Downtown. With its premier location, in the capital city and the Heart of Texas, this property lends itself to both the eclectic vibe of the 6th St Entertainment District and the professional landscape of the Austin Convention Center. Innovative Carpets partnered with Leo A Daly in developing timeless, refined and stately patterns totaling 6000 square yards of axminster carpet throughout the Ballroom, Meeting Room and Prefunction spaces of this classic property. Whether you are in town for the jet-set music atmosphere or the relaxing, opulent pampering this property has to offer, your satisfaction is sure to be guaranteed. September 2013: Located near one of Southern California’s most historically panoramic cities, this 24-acre property is a must-see for all vacationing in the Santa Barbara area. The design intent for the newly renovated corridors consisted of 5,000 sq/yds of axminster carpet was to capture the architectural details reflected in the local Missions and to pay homage to the Spanish Colonial style of the hotel. Working closely with our design partners resulted in an organically-simplified pattern with mission style elements that have an inherently timeless quality. August 2013: Working in collaboration with Host Hotels and Resorts, Inc and Design Group Carl Ross has resulted in two flawlessly executed Innovative Carpets projects this past year. Nestled in the center of world-class shopping, championship golf courses and the tranquil Newport Beach Coastline is the Newport Beach Marriott Hotel and Spa. The $70 million transformation of its guestrooms and corridors resulted in an updated, coastal destination property that embodies Coastal Living. A distinctly modern, yet sophisticated design has transported the corridors of the Marina del Rey Marriott into the 21st Century and beyond. This 370 guestroom property exudes style, taste and glamour. Collectively, these 2 projects comprised over 7,000 sq/yds of custom axminster carpet. May 2013: When the time came to renovate the Boomtown Casino “Known as the friendliest casino in Louisiana”, Innovative Carpets was chosen to supply over 8,000 sq/yds of custom axminster carpet for the casino floor. March 2013: Perfectly situated on Nicollet mall the contemporary Hyatt Regency Minneapolis pays tribute to the unique culture of Minnesota. 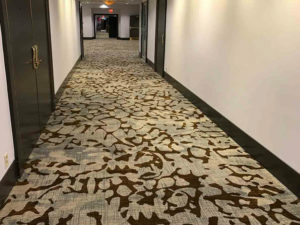 Innovative Carpets is proud to have been part of the hotel’s renovation which consisted of manufacturing over 8,000 sq/yds of custom axminster carpet. January 2013: Redefining luxury in the UAE, the new Rosewood Abu Dhabi is scheduled to open in April 2013 and will be an iconic five-star, high-rise hotel and residences with extensive amenities for business professionals and travelers alike. Collaborating with the creative expertise of BBG-BBGM’s New York and Abu Dhabi offices, Innovative Carpets designed and manufactured over 3,000 square yards of custom axminster carpet to adorn the hotel’s public spaces. The contemporary-styled carpet, infused with rich colors and traditional elements, complement the sophisticated Ballrooms and Prefunction spaces that showcase panoramic views of the Arabian Gulf. All custom patterns were designed and manufactured “woven-to-plan” to minimize waste and maximize the dramatic impact of the uniquely-shaped rooms. With homage to traditional Middle Eastern architecture, the carpet designs were inspired by the surrounding landscape of the golden Abu Dhabi desert sand, juxtaposed to the crystal blue sea. 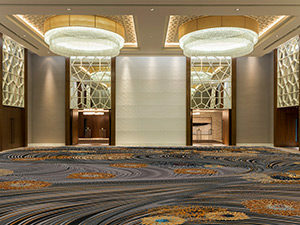 July 2012: Innovative Carpets continues to expand globally with its recent design and production of over 80,000 square feet of handtufted rugs for Manila’s Solaire Resort and Casino, scheduled to open in the first quarter of 2013. Purported to be one of largest handtufted orders to date, Innovative had the privilege of working directly with famed architectural firm, Steelman Partners, world renowned for their architecture, planning and award-winning interior design. Intending to provide guests with an authentic “Las Vegas” experience, the custom-made wool rugs feature vibrant colors and vivacious patterns. Innovative Carpets worked intimately with Steelman for all 51 specifications, manufacturing more than 120 custom-designed rugs for the public areas, private gaming salons and assorted VIP suites. July 2012: Ideally located at CityScape, Phoenix’s shopping, dining and entertainment hub, Hotel Palomar is an experience in modern, yet timeless style and sophistication that represents the area’s transformation from sand to city to solace. The community’s influence is vividly seen in this boutique hotel’s aesthetics, where mirrors are framed by leather belts, daisy chains hang burnt-red lanterns, and guests mingle in the open-air lounge. In keeping with this theme, Innovative Carpets manufactured over 5,000 square yards of axminster carpet for the hotel’s corridors and public spaces. June 2012: It’s always impressive to be seen in the lobby of the Beverly Hills Hotel, especially when you’re the carpet! This summer, as the world famous Beverly Hills Hotel celebrated its 100-year centennial, the property embarked upon a Lobby restoration honoring the legendary glamour of the iconic property and the history of the Beverly Hills community. 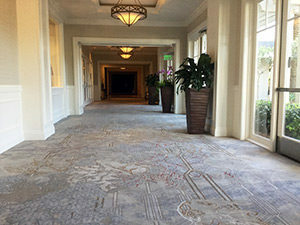 For this project, Innovative Carpets had the honor of collaborating with Tihany Design to create elegant, yet modern, handtufted wool carpets to complement the Beverly Hills Hotel’s uniquely shaped lobby. For this project, Innovative manufactured over 10,000 square feet of handtufted carpets in record time to coordinate with the celebrity-studded June centennial celebration. Click here for the Hotel Business article. 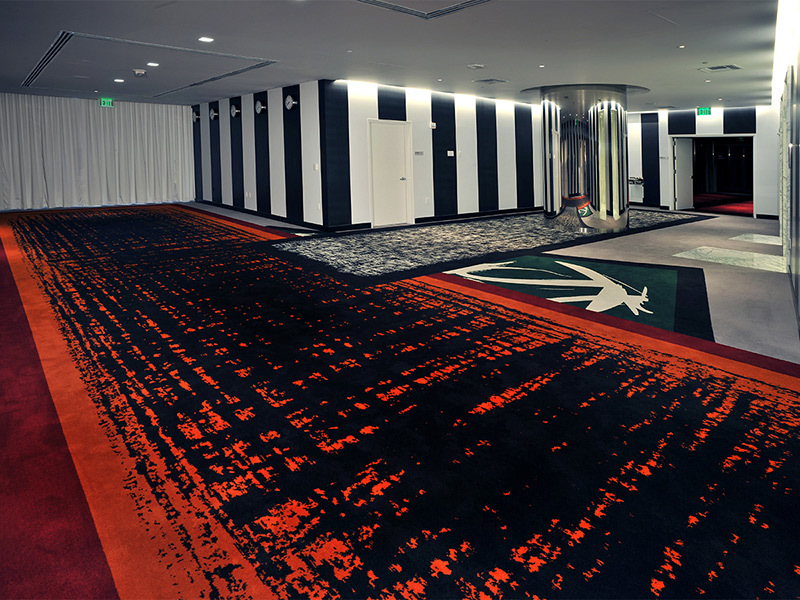 June 2012: As part of the Grand Hyatt San Francisco’s multi-phased $70 million renovation, Innovative Carpets collaborated with indidesign to manufacture over 4,500 square yards of axminster carpet for the property’s corridors and public spaces. The newly transformed hotel has redefined urban luxury on San Francisco’s Union Square. November 2011: Towering above Lake Charles stands Louisiana’s L’Auberge du Lac Casino Resort, a 26-story hotel complex that combines luxury with down-home comfort. Overlooking the beautiful Contraband Bayou, the resort offers guests non-stop gaming action in its expansive 70,000 square foot casino; its floors complemented by Innovative Carpets’ arts and crafts style axminster carpet. Totaling over 14,000 square yards, Innovative’s custom designs enrich the unique décor of L’Auberge’s lobby, promenade and casino areas. October 2011: Following a two-year transformation, October marked the highly anticipated unveiling of Los Angeles’ Hotel Bel-Air. Since its opening in 1946, this boutique hotel has served celebrities, heads of state and dignitaries and is part of the Dorchester Collection group of international luxury hotels. As part of the renovation, Hotel Bel-Air’s 103 guest rooms and suites have been modernized to reflect a new generation of design aesthetic and now feature over 2,000 square feet of custom-designed Innovative Carpets handtufted area rugs. These hand-sculpted, multi-level rugs are indicative of the newly restored Bel-Air glamour renowned during the 30’s, 40’s and 50’s. The bold graphic patterns are fresh, yet undeniably elegant, to complement the modern luxury of this storied hotel. September 2010: An exclusive luxury hotel reviving the elegance of Old New York. Built in 1905, this Stanford White-designed building was originally a clubhouse for The Lambs, America’s first professional theater club. Legendary members included such celebrities as Charlie Chaplin, W.C. Fields, John Barrymore, Spencer Tracy and Fred Astaire. Today, the landmark property is a popular spot for contemporary celebrities who appreciate the allure of Art Deco style coupled with the modern flair of an iconic masterpiece. For this work of art, Innovative Carpets collaborated with legendary design firm The Office of Thierry Despont to create the Deco-inspired custom handmade wool rug for the hotel’s primary function space at the Cellar Level. By engineering an ultra-durable spec, Innovative interpreted and delivered the designer’s vision: a masterpiece wall to wall rug. The over-size wool rug is a designer’s dream in that it’s a dramatic focal point in the room, yet with the muscle and brawn to entertain the foot wear and traffic of today’s crowd. 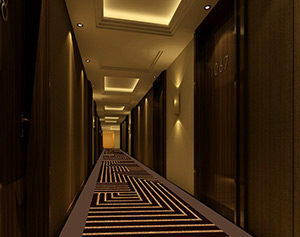 In addition, Innovative also produced the axminster carpets for the Guest Corridors. July 2010: Las Vegas developers have had the golden touch when it comes to rebranding. Nowhere is this rebranding showcased more then at the newly renovated Tropicana Resort. Innovative Carpets was proud to manufacture over 20,000 sq/yds of corridor carpet which encompassed both of the historic skyline towers of the the Tropicana. CEO Alex Yemendijuan, combined the United States greatest party cities to create a Miami South Beach Casino in the Las Vegas Desert. Miami Vibe and Style with Las Vegas gaming, what else could a hip vacationer want? April 2010: Located in the historic Chelsea neighborhood on Avenue of the Americas at 30th Street, New York City. The Eventi’s interiors are a reflection of its artful surroundings. 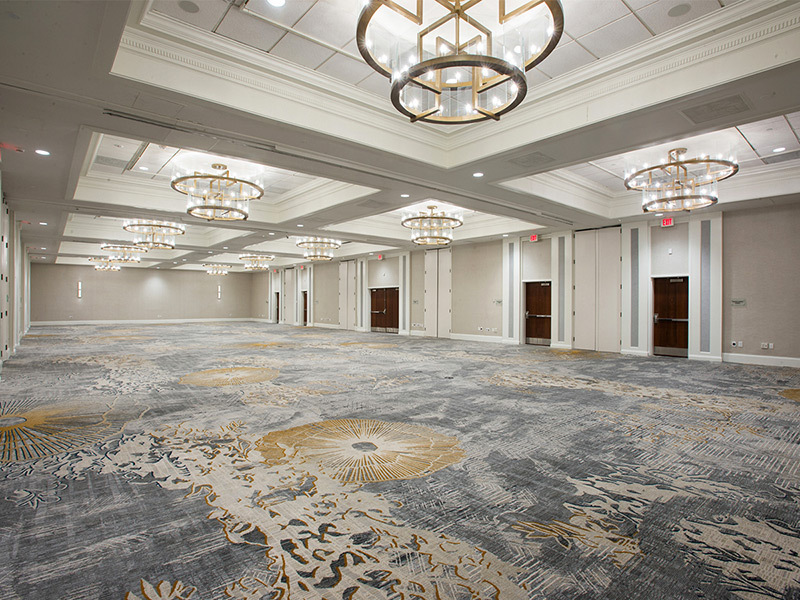 Under the design direction of McCartan, Innovative designed and manufactured all of the custom axminster carpet for the dynamic Ballroom/Function spaces, as well as the Guest Corridors. There is nothing “usual” about the creative vibe one feels as a guest of this property. Exceptional design layouts in both Ballrooms, free of boundaries or borders, were woven-to-plan resulting in a series of “floating carpets” amidst a sea of subtle blue tones. Outside in the Prefunction areas, rich tone-on-tone wool handtufted rugs welcome visitors as they prepare to enter two of the most extraordinary meeting/function spaces in all of NYC, elevated above the busy city streets of NYC. For over 29 years, our goal at Innovative Carpets has been to deliver clients with a superior combination of the finest products, coupled with exceptional service. © Copyright Innovative Carpets - All Rights Reserved.